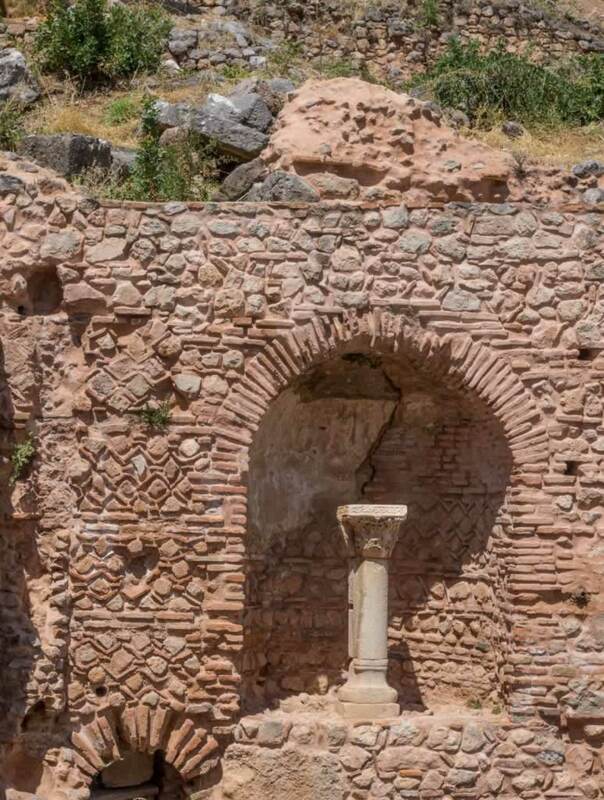 After two days of exploring Athens with its Acropolis, Lycabettus Hill, Plaka, Syntagma, the Archeology Museum and the many ruins of ancient buildings, most people start wondering what would be the best day trips from Athens. If you are one of them, I have some answers for you. You’ll find here some self-guided trips, but also some organized day tours from Athens, trips to Greek islands. Self-Guided Day Trips from Athens vs. 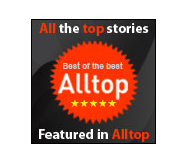 Guided Tours – What To Choose? There are pros and cons to each of these options. I usually prefer to design my own trips, because this offers me the independence I need. If I like a place and I want to stay longer, I can change my plans for the rest of the day. If I’m tired, I stop for a break. If I feel like taking a swim between visiting two archeological sites, I jump into the sea. However, guided tours have a great advantage; they enable you to discover the history and the most interesting stories of a place. A good guide will have you hooked on wanting to know more about the places you visit. A guided tour of Athens will save you from doing your own research to understand what you see. Sometimes, going on a tour comes with the skip the line privilege, which can save you a lot of time. Renting a car and going places will allow you to make your own schedule as you like. On the other hand, you may end up paying more than if you were joining an organized tour. Greek highway tolls are quite high, car rentals in high season are also pricey, so you can easily end up spending the same amount if not more than the price of an organized tour to Delphi, Meteora, Rafina, Marathon or Cape Sounion. On the other hand, using public transport will help you travel on a budget. Nonetheless, you should expect to spend way more time on the road, as KTEL buses make frequent stops. Besides, you may have to change the bus at least once to get to some places. Trains are better, but there are places around Athens that you can’t reach by train. This is why sometimes organized tours are the best option. Greece in a right-driving country. EU citizens are allowed to drive in Greece if the hold a valid driving license issued by their country. People outside the EU need an international driving license. Take this very seriously, as you won’t be allowed to rent a car with your US driver’s license. Furthermore, the fine is about 1,000 Euros (at least this is what the customer service representative of the company we’ve rented our car from told us). Even if you hire your car and you pay the fee online, you’ll have to show your driver’s license in order to get the vehicle. Driving on highways in Greece is easy, but keep in mind that there are multiple toll stations along the way. Keeping some change handy will prove useful. Nonetheless, they always give you change. You can also pay with your credit card (we did that several times and it worked just fine). This multiple toll stations system is quite smart, as you don’t realize how much you actually pay in total. We did the math and we quickly arrived to about 90 Euros in motorway tolls from the Olympic Riviera to Athens. Driving in Athens isn’t as bad as it appears. The Athens Ring Road (Attiki Odos Highway) contributes a great deal to the improvement of the traffic inside the city. Most of the narrower roads are one-way. This adds to the fluidity of the traffic. If you find accommodation in the center of Athens, you’ll be able to take lots of day trips to various areas, as you’ll get on the ring road rather quickly, and then head over to your destination. Parking the car in Athens, though, is quite a challenge, so brace yourself for some heavy walking. It’s best to leave your car where you’ve parked it and use the metro or taxis instead. Here are my suggestions of trips to take from Athens and get back the same day. Some of them would be better if you were able to spend one night in the place. However, if you don’t have enough time but you feel like seeing as much of Greece as you can, these one day trips are an acceptable compromise. You have three options to get from Athens to Delphi: car, bus and train. If you already have a car, you should consider driving. Of course, there’s always the option to take an organized tour to benefit from professional guidance while you do nothing else than relax and enjoy yourself. Even if you get to Delphi from Athens on your own, you may still want to enjoy a guided tour of the archeological site like this one, here. 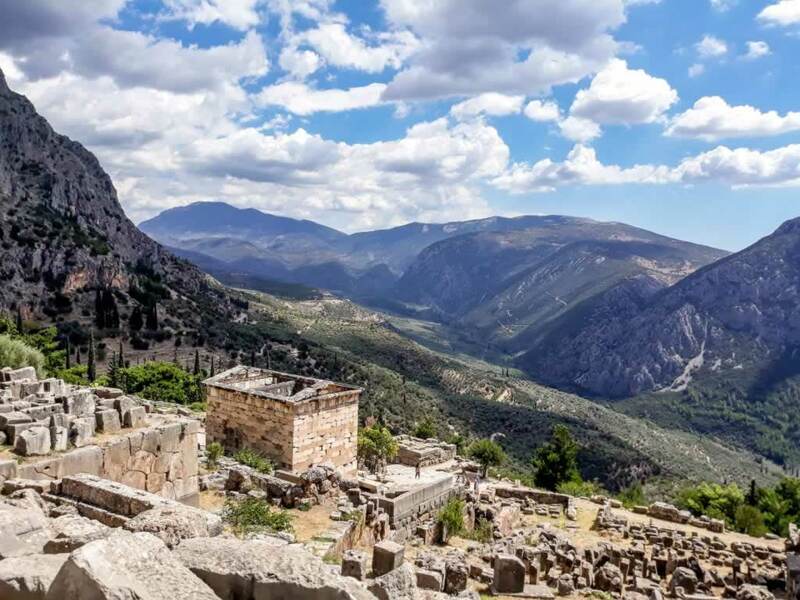 The tour takes about 1.5 – 2 hours and it includes a skip the line entry ticket to the archeological site and to the Delphi Museum, as well as the services of a licensed guide. This tour is available in English, French, Greek, Italian and Japanese. 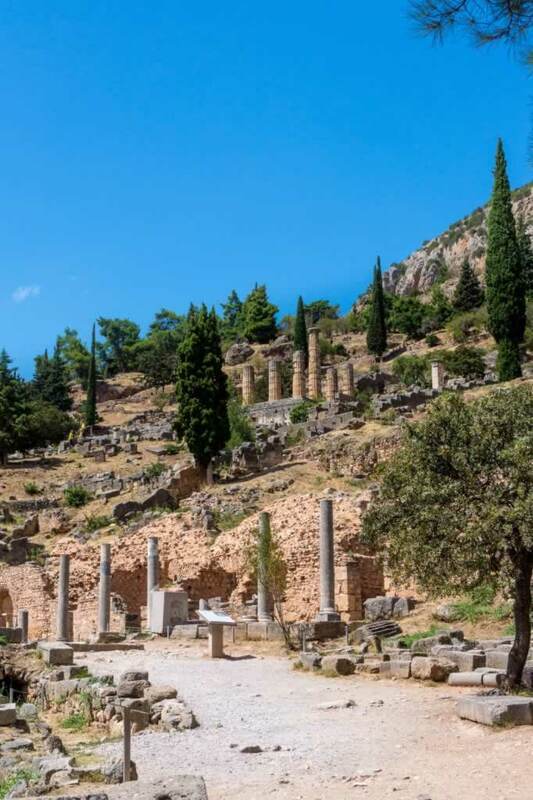 Ancient Delphi full day private photography workshop – you’ll need to have your own camera and photography gear, as this tour is at the same time a photography lesson. 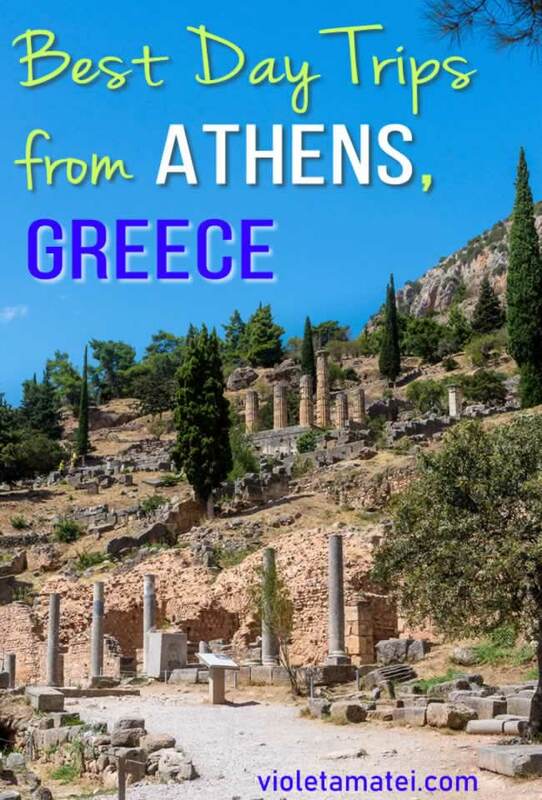 The tour includes private photography guide, Delphi entry ticket, and transportation from and back to Athens. Athens to Delphi full day road trip – this tour will take about 8.5 – 9 hours, as it includes stops in Arachova and Livadia. If you are located in the Syntagma area in Athens, you’ll also have free pickup from your hotel. Outside this area, you’ll need to pay an extra fee to benefit from this service. The driving distance from Athens to Delphi is about 200 km. You’ll need about 2 hours and 30 minutes to get there. Depending on where you are in Athens, it may take longer. If you want to start from the airport, you’ll be on a major highway right away. Road signs in Greece are very good, so it’s difficult to get lost. If you feel the need, though, you can buy a prepaid SIM card in any EU country to use Google Maps, Waze or any other navigation app you may want. As you pass Livadia, you may want to stop for a visit to the Medieval Castle. Next, follow the road to Arachova. 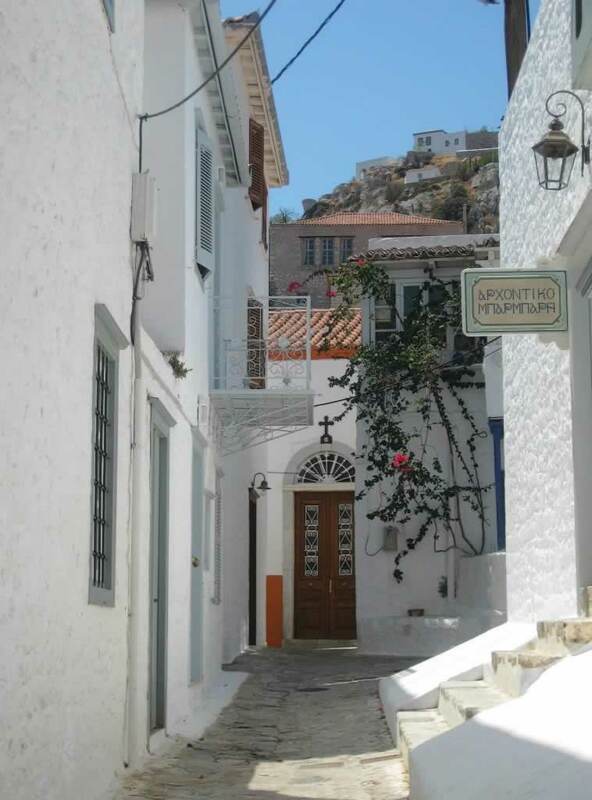 You’ll know exactly when you’ll get there, as the curvy road reveals the stone houses and the majestic church built on the slope of Mount Parnassus. If you are like most people, you’ll want to stop the car and take some photos. In fact, Arachova is one of the best ski resorts in Greece, so you may want to spend an entire vacation here. Arachova is at about 8km from Delphi. You’ll start to see lots of tourist buses. 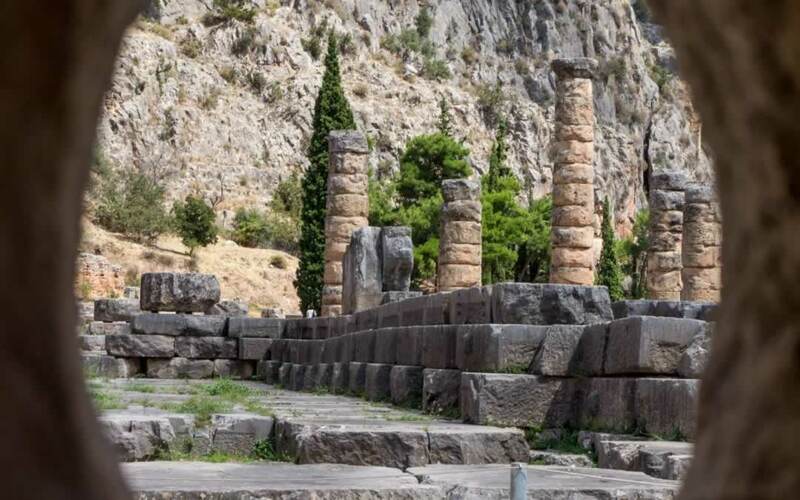 Delphi is one of the most famous tourist sites in Greece, so you can’t expect to visit it in privacy. You’ll do the line with hoards of people, you’ll walk through the gates of the archeological site surrounded by people and sometimes you’ll have to wait for organized groups to move on in order to be able to read the descriptions of all those temples and artifacts.You’ll walk along the Sacred Way to see the remains of the Temple of Apollo and of the Sanctuary of Apollo. The Sanctuary of Apollo was the place where Pythia would sit and receive the messages of the Oracle. Despite the crowds, Delphi is an awesome place and definitely worth a visit. In fact, very few tourists will climb the slopes to the top of the mountain. 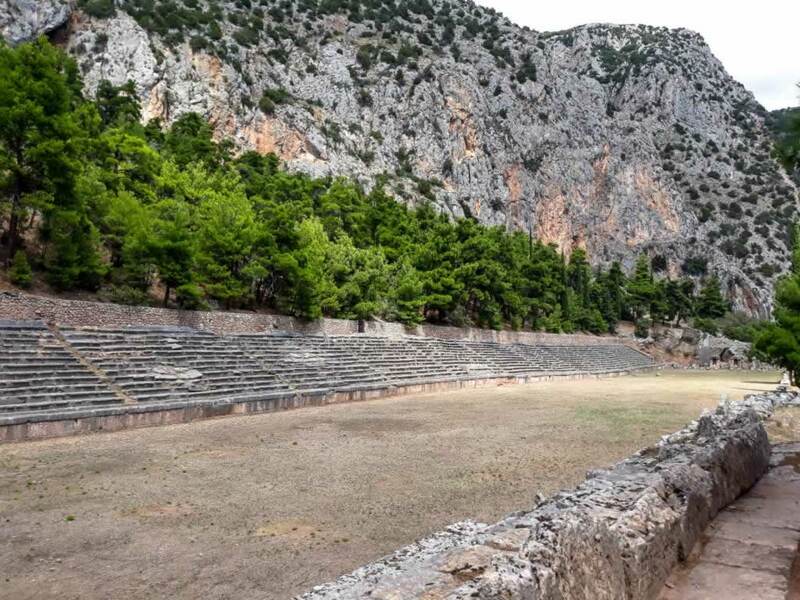 If you are fit enough, you’ll get to see the ancient Stadium and a neat panorama of the whole site of Delphi. 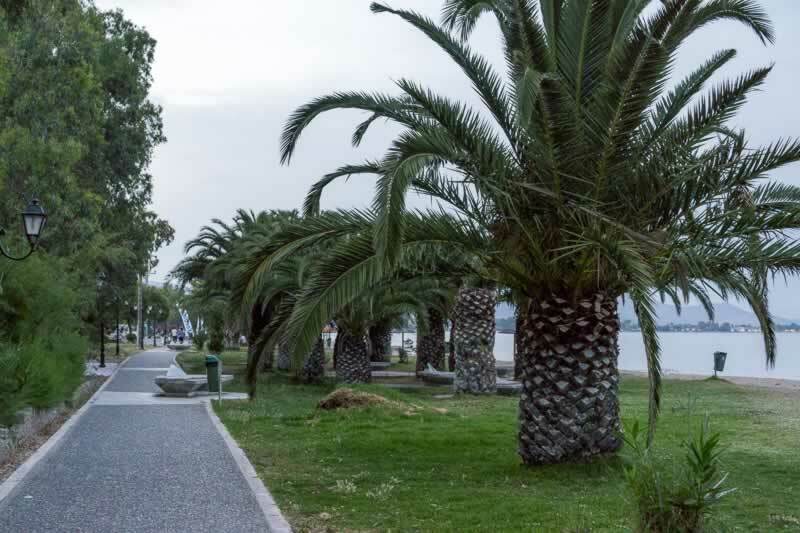 You can visit the place where Marathon, the well-known sports competition has its roots, in this one day trip from Athens. If you choose public transport, you need to take the orange KTEL bus. The station is in central Athens, nearby Omonia Square, on Mavromateon Street. Here’s the KTEL Attikis website where you can find the timetable and other useful information. The easiest way to do it is to get to Rafina and then work your way up the coast toward Nea Makri and then to Marathon. 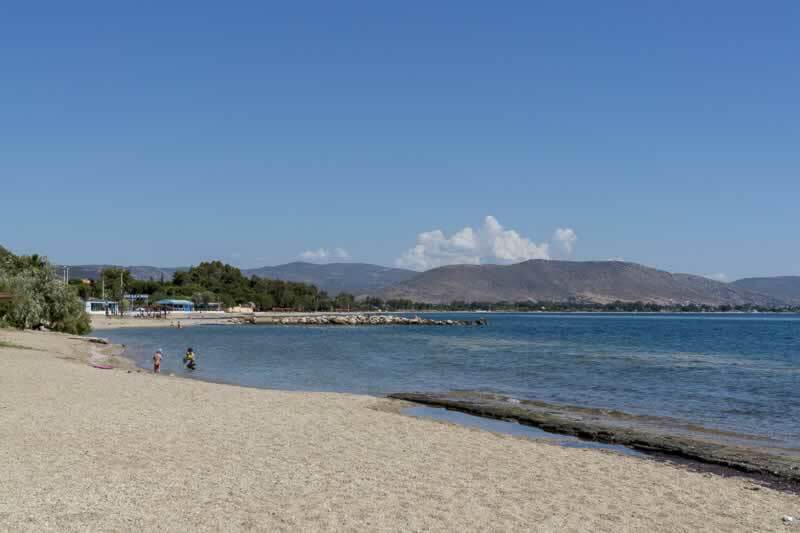 You can also do the opposite and take a bus to Nea Makri and Marathon. From there, you can take another bus or a taxi to Rafina, and then a bus or a taxi back to Athens. 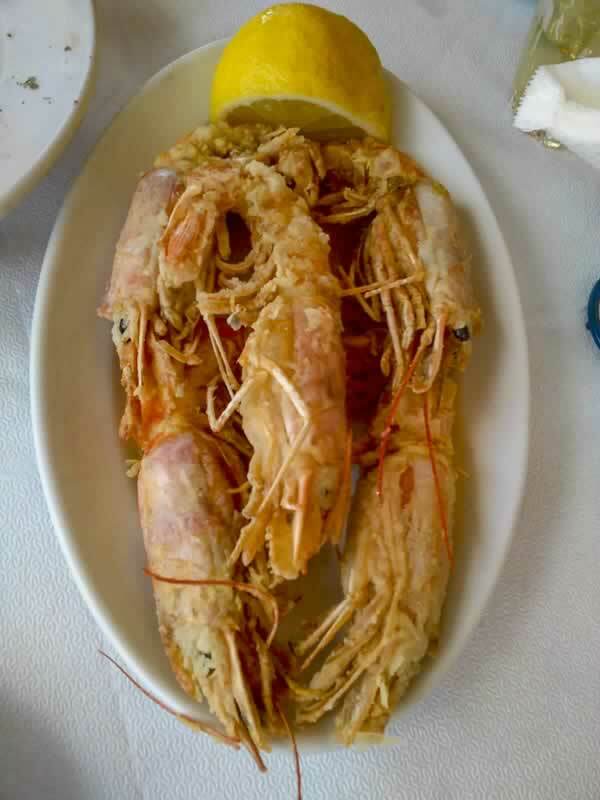 Nea Makri is one of the beach resorts near Athens worth a longer stay, but it can also be the perfect stop for a swim in the sea and for a taste of the juicy fried shrimps with a hint of lemon. If you are in Athens and you have one day to spare, you can visit three Greek islands in one day. You can do it on your own by taking multiple ferries or speed boats, or you can book a one-day cruise with one of the local tour agencies. 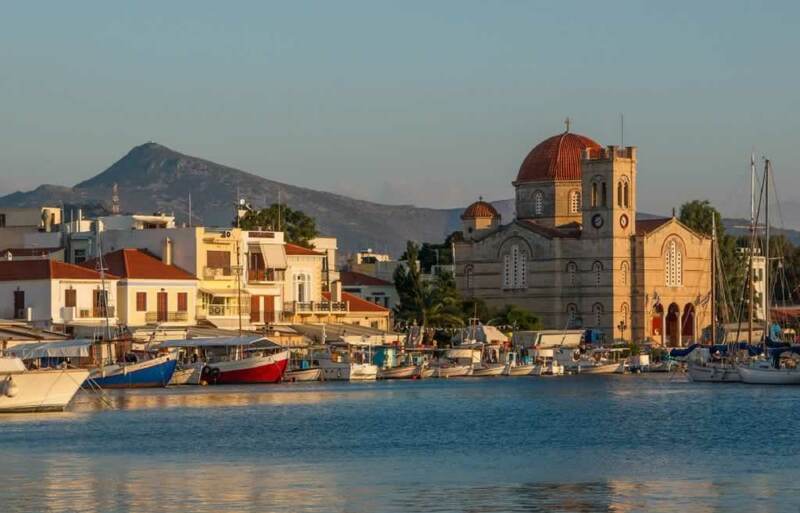 Click here to see the price and to book one of the bestselling cruises to the three Saronic islands. You’ll benefit from free pick up and drop-off service from and to your central Athens hotel. You’ll also have lunch on the boat. You’ll spend 12 unforgettable hours. If you want to take some of the optional tours on the islands, you’ll have to pay for them separately. Nonetheless, it may be better to just do your own thing on each island. That’s what I would do, anyway. This other cruise, here, is another interesting option. It is a VIP cruise that takes you to the three islands on a modern cruise vessel with all amenities you need to feel spoiled. 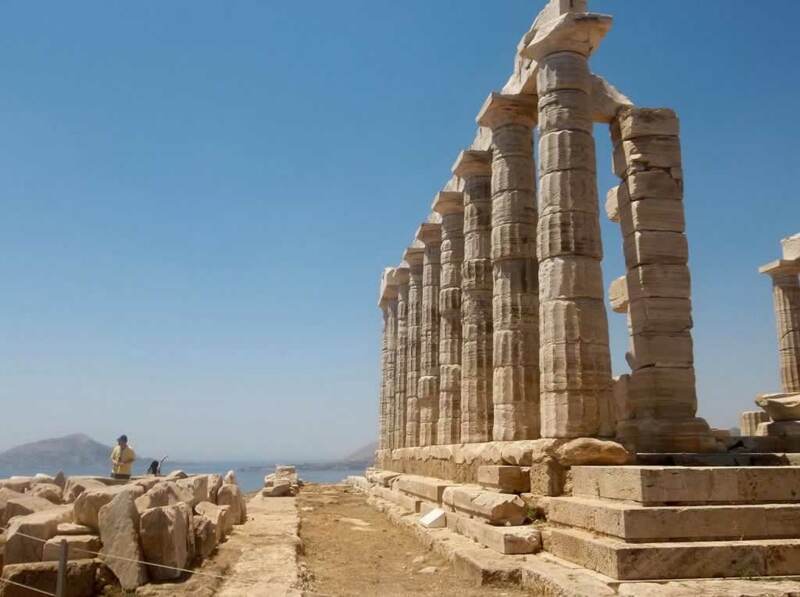 You can get from Athens to Cape Sounion by bus. However, because of the frequent stops, you’ll need to spend a lot of time on the road to cover the 70 km distance. If you are two, three or four people, you should rather hire a taxi to take you there, wait for you to visit the Temple of Poseidon, and then to bring you back to Athens. You also have the alternative to book a guided tour like this one, here. The price is probably comparable to the taxi cost but you’ll benefit from professional guidance. If you can take a two-day trip instead of returning to Athens the same day, you’ll be able to visit Arachova, Delphi and Meteora in one go. Getting to Delphi requires only a slight detour from the Athens to Meteora itinerary. The monasteries of Meteora by sunrise offer a stunningly beautiful scenery. THe sunset is also nothing short of amazing. 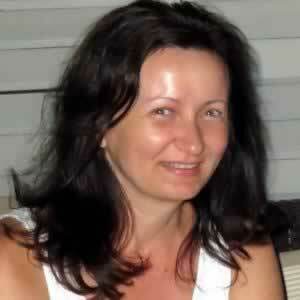 This makes it well worth it to spend one night in Kalambaka or in Kastraki, the two villages nearby Meteora. Going on a one-day trip from Athens to Meteora requires that you wake up early. The train leaves at 8:20 in the morning. If you want, you can book this full day train tour from Athens to Meteora. 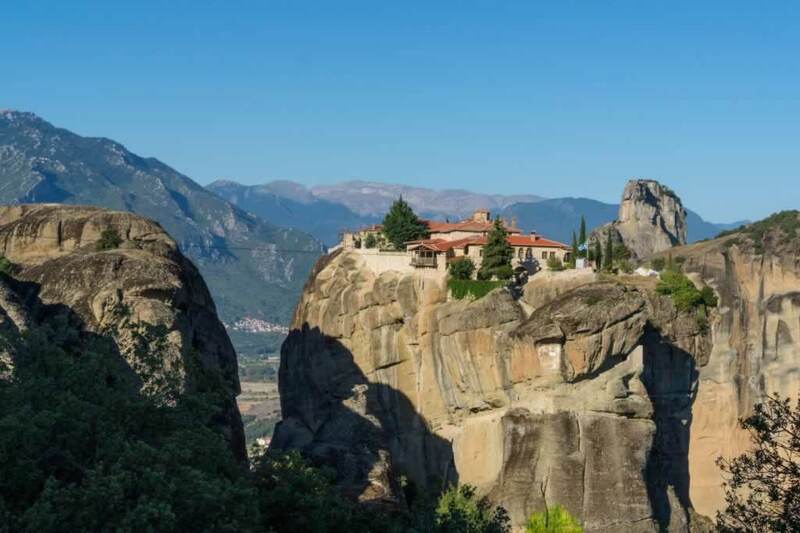 It will be nice to have a professional guide wait for you in the train station of Kalambaka to take you in a luxury minibus tour of the six Meteora monasteries. Some of them will probably be closed, but the scenery is the main point of visiting all six clifftops. 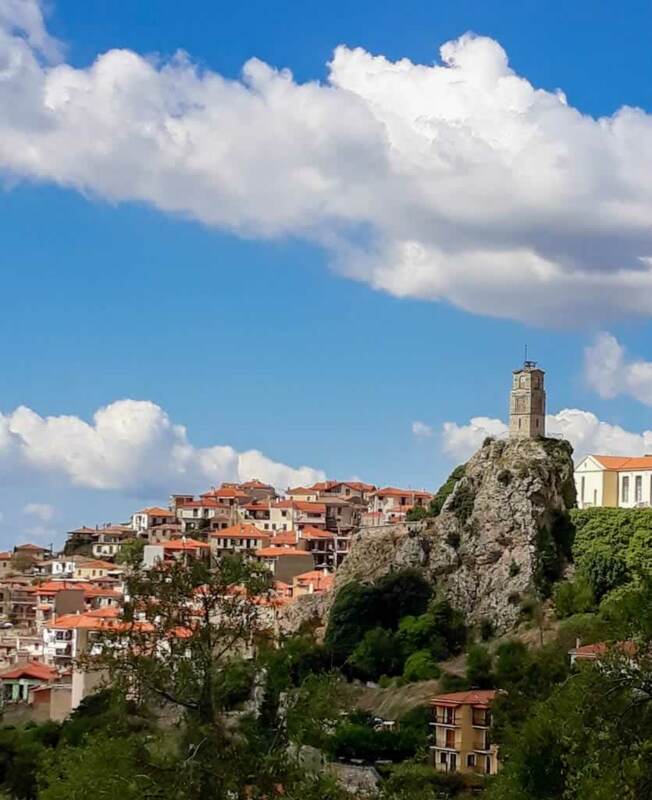 If you prefer to take the train and travel on your own, you’ll have to take a taxi in Kalambaka, because the road to the monasteries is a bit too long for walking. There are no sidewalks, so it may also be dangerous. If you don’t want to rent a car and drive in Greece, you can still visit everything you want either by public transport or by booking a guided tour. When it comes to visiting ancient archeological sites, I prefer guided tours, because I want to hear those facts from experts. At the same time, I don’t really enjoy traveling by bus. 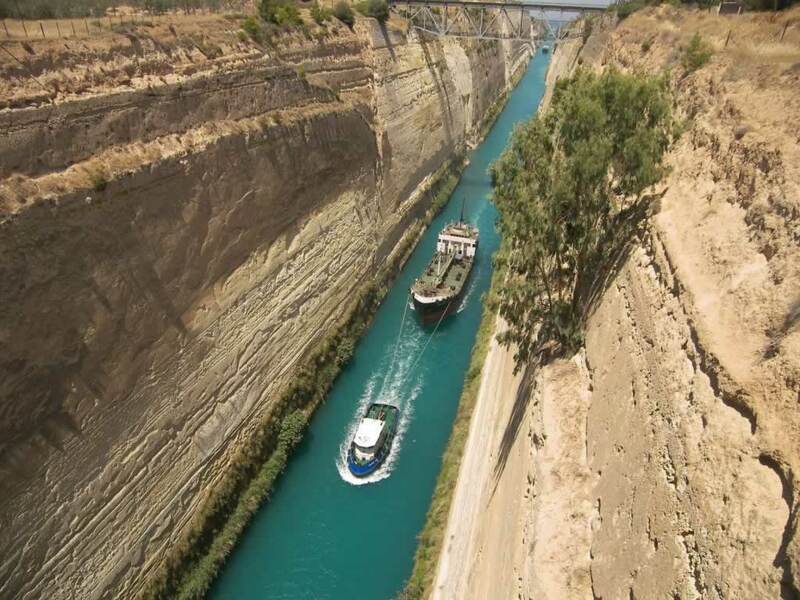 If you don’t have a problem with buses, you may want to take a look at this day trip from Athens to the Corinth Canal, Mycenae and Epidaurus. The price includes the admission to the archeological site of Mycenae, the Epidaurus Theater, and the Tomb of Agamemnon. You’ll also get a three-course lunch, if you opt for it. The bus has free wi-fi. The guidance can be in either English or Spanish. This is another guided tour from Athens to the beautiful Peloponnese. 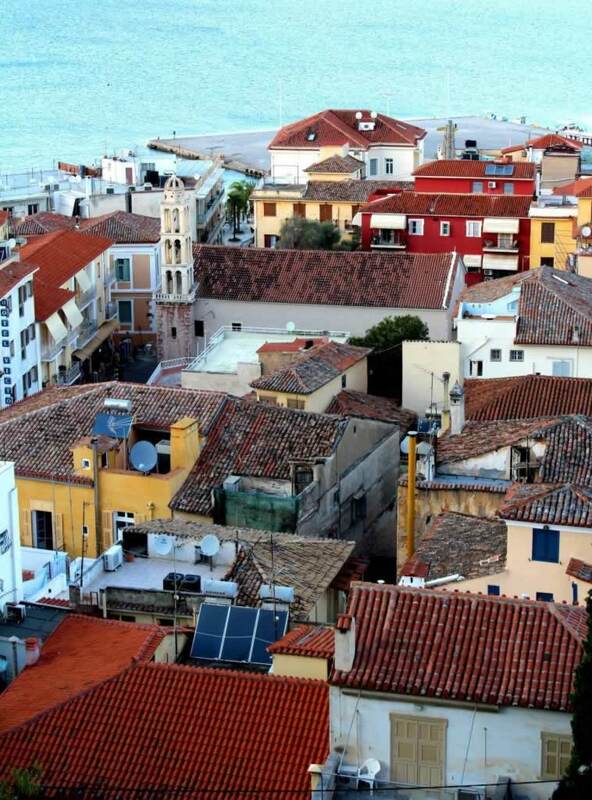 About two hours longer than the previously mentioned one, this day trip from Athens will take you to Nafplio, where you’ll probably fall in love with that area of Greece. You can see the prices as of today, Friday, April 26th 2019, and read more details about this tour here. If you were to take all these day trips from Athens, you’d need to spend one week in the city and see nothing of it. Add at least three-four days to visit the main tourist sites in Athens and you can keep yourself entertained and busy for at least ten days. Keep this in mind when you’ll plan your next trip to Greece.